The GD-chassis Subaru Impreza tempted American buyers with all-wheel-drive and sporty looks as early as 2001, but the WRX model and its turbocharged flat-4 didn't arrive stateside until the 2002 model year and the real nutter version wasn't available until 2004. The STi thoroughly transforms the Impreza from a simple economy car to a 300 horsepower tarmac rally machine complete with bone crushing suspension and brembo brakes the size of LPs. Few inexpensive 4-door cars are as fast as the STi and none match its tenacious character...except perhaps the Evo. 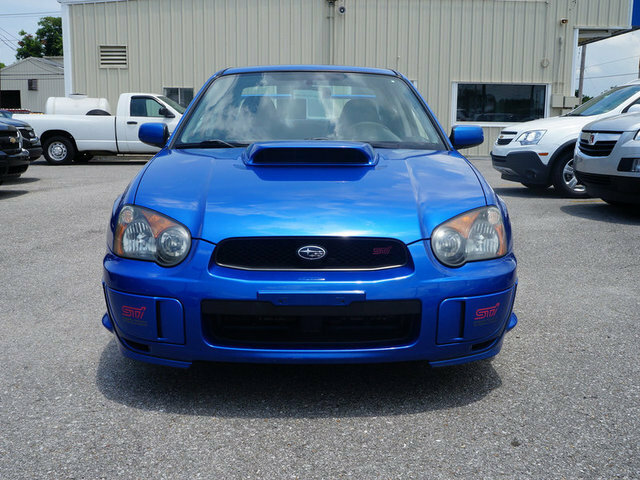 This 2004 Subaru Impreza WRX STi is for sale in Metairie, LA for $14,995 buy-it-now via ebay. Tip from carcrasher88 on Jalopnik. Let's be honest and assume that everyone who reads this site is an adult, and that no adult would be caught dead driving an STi...except...that dammit you want to let your hair grow long and ride a skateboard through your mom's living room while listening to Beastie Boys' License to Ill at full blast. Balky transmissions and punishing ride is immediately forgotten each time you mash the pedal to the floor and release the fury of 300 turbocharged flat-4 ponies. Everyone will be impressed. And many people will ask "what did you do to your car?" Tell them to watch more Top Gear before talking to you again. While other adults kinda don't get it, I get excited when little kids gawk over it and get excited to see it. That makes it an interesting vehicle rather than on that simply fits in, and that's what draws me to it. That and it's stupid fun to drive hard.